Thanks to my friend the author Karen Inglis for sending me this! I was very chuffed (yes, chuffed, my American friends, I know how much you love that word!) 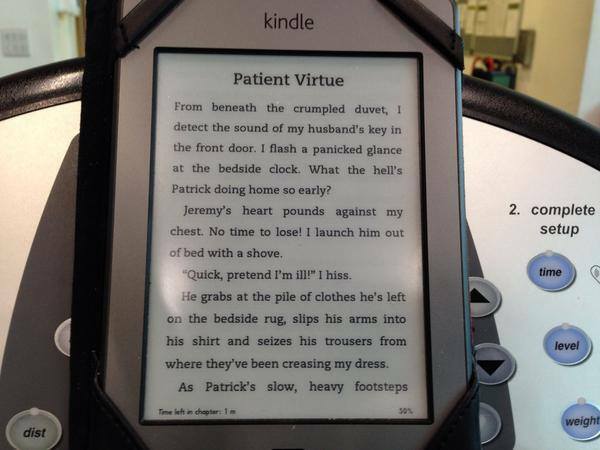 to receive a photo the other day from my friend the children’s author Karen Inglis, sharing with me the fact that she was reading my latest ebook on her Kindle at the gym. Now, I love my Kindle (and yes, other ereaders are available, as the BBC might say), and the freedom it gives me to read on the move. It makes packing for the trips in our camper van so much easier and allows my handbag to remain portable, whatever book I’m reading. But there’s another reason I love reading this way: for the last seven years, I’ve had to work around the chronic illness rheumatoid arthritis, which, when I’m having what’s known in medical circles as a “flare” (i.e. it’s playing up! ), can make my hands and wrists stiff and painful. I’m one of the lucky ones: my medication is usually pretty effective, and most of the time I’m able to forget the condition altogether. I was recently reminded of this by a fellow author Pelham McMahon who not only has RA but also has some eyesight issues. She pointed out that for those who are housebound, sight-impaired or otherwise disabled, the advent of ereaders has made the difference between being able to read and not being able to read at all. Blessed with reasonable vision provided I’m wearing my glasses, I hadn’t really thought before what a godsend these devices must be to those who can only read large-print books. Ereader technology allows the reader to choose the typesize of whatever they are reading, effectively turning any book into a large-print book. What a fabulous innovation. An added bonus is that on Amazon and many other sources, it’s possible to download free reading material legitimately e.g. classics that have passed out of copyright. So if you haven’t yet become an ebook reader, don’t dismiss the technology quite yet. For others, it’s much more than a trendy gadget. 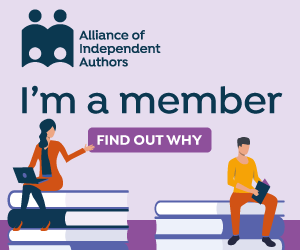 I’ve shared Pelham’s comments on the blog that I manage for the Alliance of Independent Authors – you can read the post here, if you like.